An example game in progress; the answer is Wikipedia. 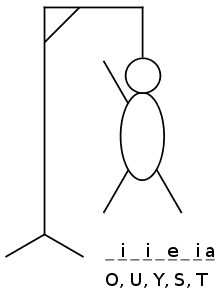 The exact nature of the diagram differs; some players draw the gallows before play and draw parts of the man's body (traditionally the head, then the torso, then the arms and legs one by one). Some players begin with no diagram at all, and drawing the individual elements of the gallows as part of the game, effectively giving the guessing players more chances. The amount of detail on the man can also vary, affecting the number of chances. Some players include a face on the head, either all at once or one feature at a time. "The origins of Hangman are obscure meaning not discovered, but it seems to have arisen in Victorian times," says Tony Augarde, author of The Oxford Guide to Word Games. The game is mentioned in Alice Bertha Gomme's "Traditional Games" in 1894 under the name "Birds, Beasts and Fishes." The rules are simple; a player writes down the first and last letters of a word and another player guesses the letters in between. In other sources, the game is called "Gallows", "The Game of Hangin'", or "Hanger". Hangman has featured in the 1978 Speak & Spell video game system under the name "Mystery Word" and is sometimes played today on Internet forums. In the English language, the twelve most commonly occurring letters are, in descending order: e-t-a-o-i-n-s-h-r-d-l-u. This and other letter-frequency lists are used by the guessing player to increase the odds when it is their turn to guess. On the other hand, the same lists can be used by the puzzle setter to stump their opponent by choosing a word which deliberately avoids common letters (e.g. rhythm or zephyr) or one that contains rare letters (e.g. jazz). According to a 2010 study conducted by Jon McLoone for Wolfram Research, the most difficult words to guess include jazz, buzz, hajj, faff, fizz, fuzz and variations of these. The game show Wheel of Fortune is based on Hangman, but with the addition of a roulette-styled wheel and cash is awarded for each letter. The following example game illustrates a player trying to guess the word hangman using a strategy based solely on letter frequency. Guesser loses - the answer was HANGMAN.